The La Quinta Inn & Suites Jourdanton has been awarded the 2015 TripAdvisor Certificate of Excellence award. The brand new, 100% non-smoking La Quinta Inn & Suites Jourdanton TX hotel, only 30 minutes South of San Antonio, is conveniently located off Hwy 97 and area businesses include: Welco Construction, Poteet Country Winery, the US Department of Agriculture, and the Chamber of Commerce. Stay here for the annual Cowboy Homecoming Festival & Parade and the Rodeo Arena. Show off your hunting and fishing skills at Atascosa River Park. The excitement of the Poteet Strawberry Festival that includes a rodeo, arts & crafts, lots of country music artists, and lots of exhibits. The River Center Mall, The San Antonio Market Square and South Park Mall are all a short drive to San Antonio. There are lots of restaurants within a few miles of the hotel. 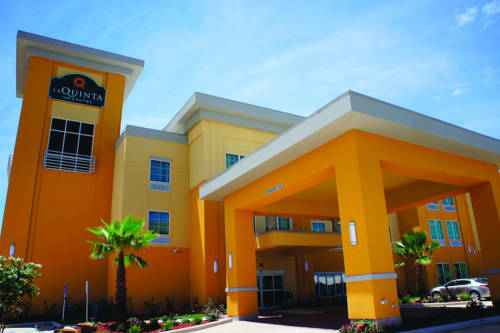 After a day of adventure, head back to the La Quinta Inn & Suites Jourdanton hotel where you can take a refreshing swim in the pool, let the bubbly spa soothe you, and get the adrenalin flowing in our on-site 24 hour fitness center. As our guest you can also enjoy free wireless Internet throughout the hotel, our business center for a quick email or flight check, guest laundry facility, meeting facility, the bright side market sundry shop, and a relaxing atmosphere. Standard features in each our spacious rooms include microwave, refrigerator, 40 inch LCD HDTV w/ premium and HD channels, luxury bedding atop a pillow top mattress, plush linens, and a coffee maker with free coffee. Wake up to our free Bright Side Breakfast which include Make-Your-Own waffles. Let our warm and friendly staff pamper you during your stay at the La Quinta Inn & Suites Jourdanton TX hotel.